If you click on the image above, you can access that poll by logging into your Twitter account and voting the appropriate time for the Halloween Run itself. Keep in mind that we'll have a Schedule of Halloween Run Day activities. 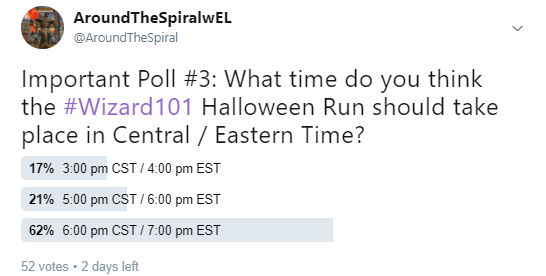 The poll above is only asking what time you think we should have the Official Halloween Run, not the other activities that will take place. The entire event will be an all day event, but the Halloween Run will take place at a certain time during the day. I'd like you to pick that time! The Official Halloween Run Schedule will be released on Monday, August 28th!